I can hardly believe how quickly the days seem to be speeding by at the moment. I can't decide whether this is a good thing or a bad thing: purely an observation, really. Yes, this is a new knitting project, but that doesn't mean that I've finished the Hetty cardigan. 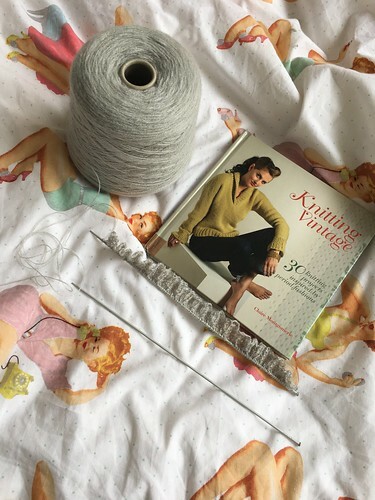 I'm a little stuck on the shoulder section and wanted something a little simpler to do a bit of mindless knitting, so I'm having a go at a pair of long socks, the pattern for which I found in this book which Lucy passed on to me. The wool was passed on to me too; I'm not sure exactly where it came from but a guiding friend had a lot of these cones to rehome and although I'm not sure how much I have, I'm confident it will be plenty for this. Linking up with this week's Yarn Along, hosted by Ginny. What's on your needles this week? I always need to have some mindless knitting around. Socks are perfect for that! are you kidding, socks = mindless knitting?? not for me, you must have talent!! All of my knitting needs to be mindless - my kids don't give me enough time to keep track of more complicated patterns! And I agree, the days are definitely flying by. Oh, what a wonderful color of yarn! And I love your bed cover - so perfectly retro! i almost "missed" the sock for the fun book and fabric. that's a great photo!! mindless for me is a hat, a simple hat!!! Yep, I missed the sock too, saw your comment and had to look twice before I saw it! I always have a few projects on the go, mindless knitting is essential! It's good to have another smaller project on the go along with a larger project. I am knitting a sweater right now but have a couple other projects on the go as well. So glad you're getting some use from the book, no way will my knitting ever be good enough for those kinds of projects!